The finals matchup at the 2016 Mid-Season Invitational is the most expected on one side and the most unexpected on the other. Korean champions SK Telecom T1 were expected to be in this position. Having cleanly knocked off the Jin Air Green Wings, dominated KT Rolster, and edged out the ROX Tigers in the Champions Spring 2016 playoffs, the one true league dynasty were unanimously regarded as the favorites to win this tournament. 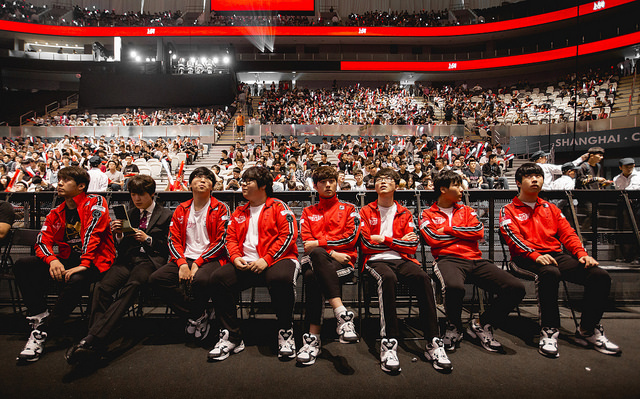 After leaving groups at a disappointing 6-4 record, including dropping four straight matches on days 2 and 3, SKT pieced it together during the break between groups and bracket play. After dropping the first game to Royal Never Give Up in their semifinals meeting, SKT slowly drained the life out of the LPL champions, defeating RNG in rougher fashion as the games wore on culminating in a perfect game four victory to end the series. North American LCS champions Counter Logic Gaming unexpectedly stand before them like a peasant challenging the reigning kings of Worlds, IEM, and Korea. Nearly every expert picked CLG to fight for their life in an attempt to only make it to the bracket stage where they would presumably bomb out. Coming from a region with historically pathetic international results CLG also clawed their way in two back and forth best of five playoff sets against Team Liquid and Team SoloMid just to gain a spot. Nothing about this team entering international play seemed convincing, as is tradition with North American squads. Yet, their team play and ability to punish opposing mistakes at the Shanghai tournament led them to a surprising 7-3 record in groups, good for second place. With SKT disappointingly finishing in fourth place, CLG was offered a palatable semifinal opponent in Flash Wolves. Four entertaining brawls later and CLG prevailed 3-1 through the strategy that led them to the bracket stage in the first place; severely and decisively punishing the mistakes of the enemy. CLG and SKT split their group stage meetings in two close contests. The first of which ended in a come from behind CLG victory after a horrendously played baron attempt from SKT. The second meeting saw CLG decisively cut through by SKT after the Korean champions stumbled in the early game. No North American team has ever beat a Korean roster in a best of five series and no North American team has ever won a Riot international tournament. In the past six months CLG has strung together an impressive run of “firsts” for the North American region, being the first to take a game off of SKT and the first to win a best of three off a Korean opponent. They now have the chance to lay claim to the Mid-Season Invitational crown. For SKT this appears business as usual given their immaculate international history, however the Mid-Season Invitational trophy is the only one lacking from their prestigious case. Blank versus Xmithie is the matchup to watch in this final. These two junglers are not the main focus of their respective rosters, yet how these two junglers perform will spell out whether CLG can truly contest the Korean champions. Xmithie is almost always a slow starter, both at this tournament with his weakest performances in the beginning and in his game performance. Regularly falling behind in farm when not placed on Nidalee, a pick banned against him in five of the 14 matches, he is a victim of the poor mid lane pressure exerted by HuHi. When HuHi finds the ability to execute cross map roams, Xmithie starts to bring his performance back and is where CLG finally takes hold of the map. Xmithie’s team fighting presence in the mid and late game is very similar to Blank’s, providing intelligent positioning and skill use in attempts at stepping up to a stronger carry role. Performing exceedingly well on Kindred, Graves, and Nidalee, Xmithie has been a top performer for CLG throughout this tournament and a central piece in their 8-2 run during the past ten matches. Similarly to Xmithie, Blank is never a fast starting jungler. Wholly reactive in play style, Blank always takes the safe, known path and has an extremely low risk play style. Rarely creating plays in the early game or exerting lane pressure, he chooses to let the opposing jungler make the first move on the map and adapts to their choice by aiming to knock down objectives or jungle camps. At this tournament he has looked most at home, to little surprise, on the power-farming Graves. Providing massive amounts of damage in skirmishes and teamfights come mid game makes it a clear choice for Blank and SKT to prioritize. In the two group stage meetings between these two teams there was very little early game presence from either jungler, both preferring to farm and look for counter gank opportunities. In the first game, Xmithie was given his powerful Nidalee and was only up 4 CS at 15 minutes against Blank’s Kindred, abnormal given the extreme farming ability Nidalee brings. In the second game, Xmithie’s Kindred took on Blank’s Graves and fell behind 17 CS at 15 minutes. With very little proactivity shown by either jungler, only a single tower was taken down and only two kills total were picked up in the 15 minutes of each game. With only six total jungle bans between these two teams all tournament long – all of which being Nidalee – it’s likely we’ll see both of these junglers swapping between Kindred and Graves all set long, looking to farm for the mid and late game. With the mid lane control in SKT’s favor, just how far the Korean champions punish the CLG jungler in the early game will be a question for their potential success. Like most international tournaments in the past three years, expect the Koreans to come out on top.